Preheat oven to 350°. Grease and flour two round cake pans; set aside. Prepare cake batter as directed on package. Pour half of the batter into a medium bowl. Add dry gelatin mix; stir until well blended. Spoon half of the white batter and half of the pink batter side-by-side, into each prepared pan. Remove to wire racks; cool completely. Mix sour cream and powdered sugar in medium bowl until well blended. Gently stir in whipped topping. 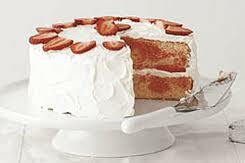 Place one of the cake layers on serving plate; spread top with 1 cup of the whipped topping mixture. Top with remaining 1/2 cup strawberries just before serving. Store any leftover cake in the refrigerator.